The Honeymooners started off as a sketch on a variety series and eventually the characters grew so popular that it became its own series. This 1955 Christmas episode is from the Classic 39--or the original 39 episodes that were sold into syndication and seen again and again by fans over the decades. I've been sharing some of the more remarkable adaptations of the Christmas short story The Gift of the Magi, originally written by American author O.Henry. So far I've discussed the 1952 film O.Henry's Full House, the 1978 TV movie The Gift of Love, a segment within 1999's Mickey's Once Upon a Christmas, Jim Henson Production's 1977 hit Emmet Otter's Jug-Band Christmas, the 1996 operatic TV version from Finland entitled The Gift of the Magi, the sitcom Alice from a 1979 episode, and the 1974 Christmas episode of the family drama Little House on the Prairie. 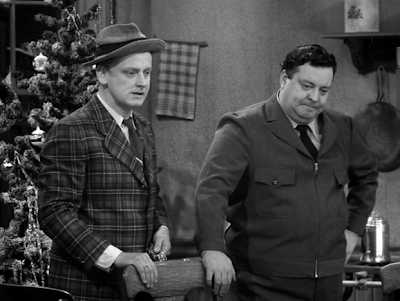 Not to be overlooked is another classic Christmas story--one from the beloved sitcom The Honeymooners. 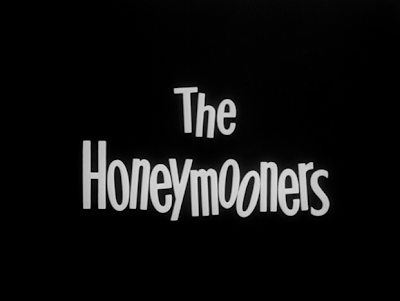 This 1955 episode is not only a quintessential Honeymooners story line but it is one of many TV fans' favorite episodes of the entire series. 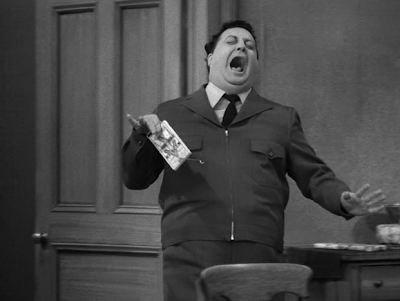 Ralph Kramdon accuses his wife Alice of hiding his gift because she doesn't trust him. This itself is a joke because we all know Ralph's not trustworthy! Though not the first of the Honeymooners' Christmas sketches, fans of this series will recognize that this episode entitled "Twas the Night Before Christmas" is one of the original Classic 39 and the Christmas episode that is most easily available for viewing. Alice is smart enough to put out a rat trap to catch Ralph sneaking around for his hidden Christmas present. 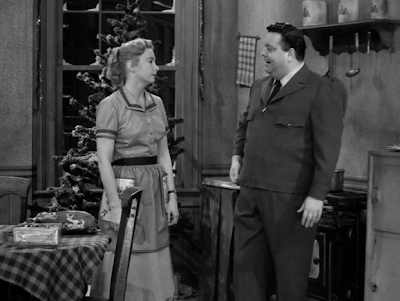 Though there are a few Christmas gags that run throughout the episode--such as Ralph acting hurt when Alice hides his Christmas gift because she doesn't trust him, and Ed Norton decorating the Kramdon Christmas tree by throwing strands of tinsel over his shoulder, under his leg, or like he's pitching a baseball--the heart of this episode is inspired by The Gift of the Magi by O.Henry. 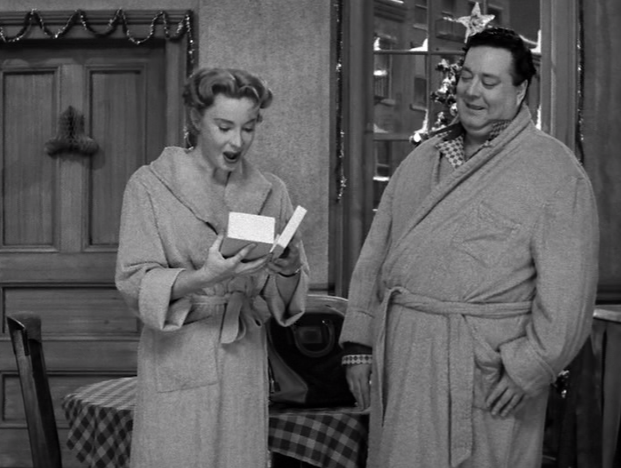 Ralph discovers that what he's bought as a Christmas gift for Alice--2000 matches glued together to make a hairpin box--isn't as special as he was told by the man at the store. When a neighbor gives Alice the same gift and calls it a trifle bought from a novelty store, Ralph knows he can't give Alice the same gift. Feeling guilty that he spent all his savings on a gift for himself--a brand new bowling ball--Ralph schemes to get more money. Ralph shares with his best friend Ed Norton about how bad he feels for spending his money on a gift for himself. Like so many other Honeymooners episodes, Ralph needs to make some more money. Eventually Ralph decides to pawn his new bowling ball in exchange for money to buy Alice another present. On Christmas morning, Alice hands him her gift first--a bowling bag for his new bowling ball. When she insists he put his new ball in the bag, Ralph confesses that he's sold his bowling ball. 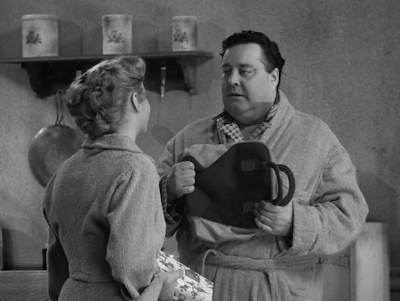 After receiving a bowling bag as his gift, Ralph is forced to confess that he sold his new bowling ball. We never actually SEE Alice's gift although it is described in detail. When Alice opens her gift, we see her surprised but very happy with what she finds: an orange juice squeezer in the shape of Napoleon! 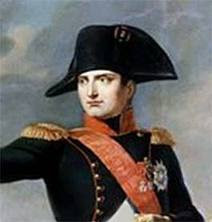 (Ralph explains you push the oranges on the top of Napoleon's head the juice drips off the sides of his hat). What makes this story so emotional is that TV viewers saw in the beginning of the episode is that Norton's wife also received one of these squeezers as a Christmas present, and Trixie and Alice were making fun of the ridiculous gift. Now Alice finds herself with one as the best gift Ralph could come up with. Fans of the series know that Alice puts up with a lot from Ralph and though he tries his best, he often comes up short. And in the end, Alice always loves him anyway. Here, in this Christmas episode we see once again, Alice loves him anyway--and she pretends that this is the best gift she's ever received. If this heart-warming episode doesn’t get to you, you’re made of stone! The cast returns to center stage to express their holiday greetings. After the gift exchange scene, the cast of The Honeymooners comes forward on stage and breaks the fourth wall to address the live audience (and the TV audience) to express their holiday greetings. I absolutely LOVE IT when TV series' casts address their audience--there's a long tradition in Christmas episodes for TV shows to do this. Do you have a favorite example? Share it in the comments below. Another favorite moment in this episode: Ralph explains why he loves Christmas time. 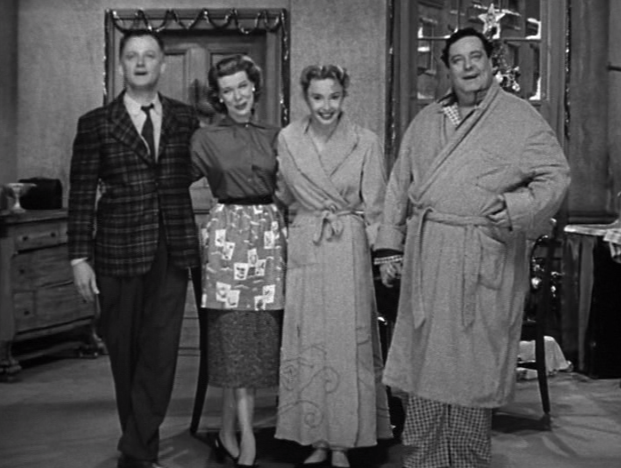 My favorite example of a TV cast that breaks character to express their holiday greetings is one I discuss at length in my latest book Merry Musical Christmas: Vol. 1 because it's also a musical moment. In the 1985 holiday episode "Twas the Episode Before Christmas" of the TV detective series Moonlighting, the cast and crew and their families together sing the popular carol "The First Noel." 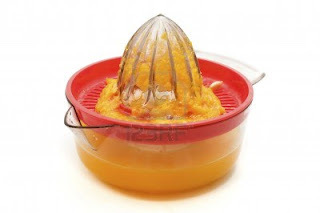 I've always thought someone needs to sell a Napoleon orange juice squeezer for the many fans of this episode. If I can buy a leg lamp, I don't know why I can't find one of these!? I bet it would be a best seller. Have you ever seen one? No I haven't, but will buy one if I every find it.